Join us in celebrating the 35th anniversary of Jump Rope for Heart by encouraging your child to participate in the CPS Jump Rope for Heart event on October 23rd @ 4 PM in the CSC NPAC arena. 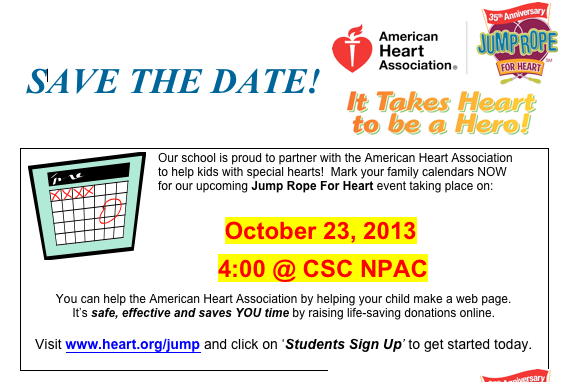 Visit www.heart.org/jump to sign up today. It's nearly October and that means that it's time for the fall Measures of Academic Progress (MAP) assessments. The purpose of taking MAP assessments in the fall is to get benchmark scores for our students in the areas of math, science, reading, and language arts. When students take MAPs again in the spring, the benchmark scores allows us to measure academic growth of the course of the school year. Once student have finished taking the fall MAP assessments, the students and their teachers will work together to create student growth goals and action plans to achieve their goals. These goals and action plans will be mailed home to parents in December. We only have 4-week window to get all 260 students in the middle school tested in all 4 areas, so it is a pretty tight window. 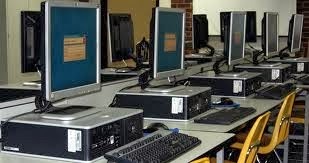 We really need all of the students in school on their testing days. I have included a link to the FALL MAPS SCHEDULE so that parents are aware of which days students will be taking the assessment. As always, CMS greatly appreciates the wonderful support that we get from our students' parents and if you have any questions or concerns, please let me know. Chadron Middle School held its annual 5th grade fun night on 9/20 in the CMS gym. Students played games and completed a scavenger hunt that is designed to help them become more familiar with the middle school and our teachers. Thank you to Mrs. Kaus and the CMS Student Council for organizing and hosting the event. The students had a great time! 5th graders get balloons tied to their legs for balloon tag! The final round of balloon tag - 5 kids enter, 1 kid leaves! 5th graders work in teams to complete the scavenger hunt. 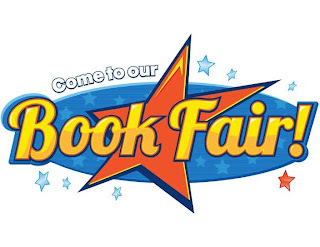 The Middle School Scholastic Book Fair will be held during parent-teacher conferences on September 19th. The books will be set up on the stage in the Middle School Gym. There is a great selection of books for Middle School and High School students, as well as parents. Come and check out the Book Fair. Profits earned go toward new books for the Middle School Library. Thank you for an excellent beginning to the school year! I am very pleased with the work that has happened through the first quarter and I continue to look forward to working with all of the students, parents, and staff at Chadron Middle School. I would also like to thank each of you for all of the support that you provide your students at home and for continuing to support the academic and extracurricular programs at school. With that support in mind, I would like to invite you the middle school’s parent/teacher conferences, which will take place on September 19th from 2:00-8:00 in the CMS Gym. Teachers will have a break from 4:00-5:00 for dinner. I believe that parent/teacher conferences are extremely important because it provides parent/guardians the opportunity to discuss their child’s academic progress with the classroom teachers. I also encourage you to bring your student(s) to the conference because we want to stay focused on the ways that we can work together to help them be successful in school and they should be a part of that conversation. If you have any questions or concerns, please feel free to call me at 432-0708. Thank you again for all that you do to support your child and the school and I will look forward to seeing on September 19th. It is hard to believe, but mid-quarter is on Friday, September 13th! School is back in full swing, routines and procedures and in place, and students are getting back into the habit of completing homework assignments. 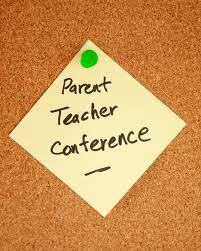 September 19th @ 2:00 - CMS Parent-Teacher Conferences. Conferences will go from 2-4 and then resume at 5-8. Obey all traffic signs: Stop signs, yield signs, one way traffic, etc. 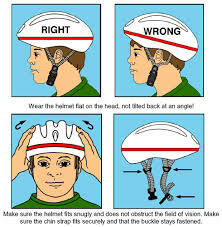 Make sure that your helmet fits and that it sits level on your head. 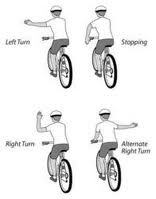 When passing, always pass on the left and yell "Left"
When riding downtown, walk bike on the sidewalk. Never talk to strangers and notify an adult if a stranger talks to you. 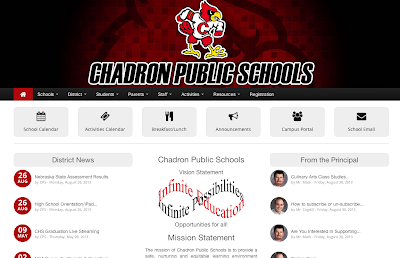 Chadron Public Schools Website gets a Makeover! The CPS website got an extreme makeover and the new site is up and running. 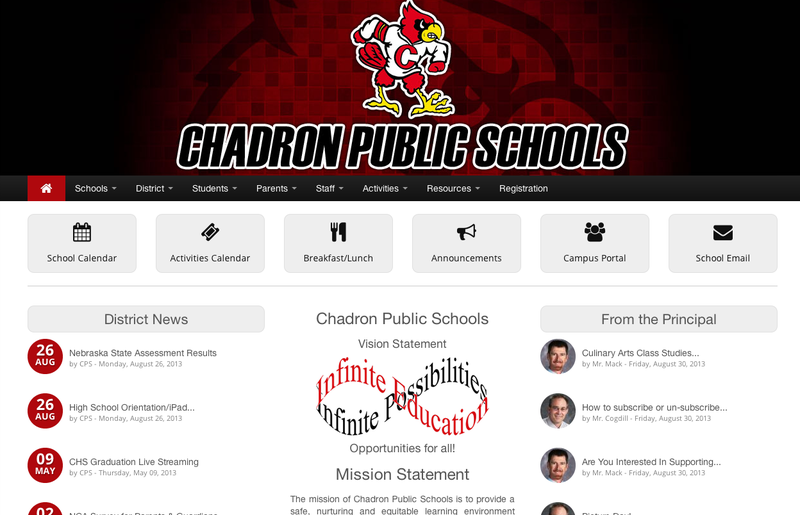 You can check it out at http://www.chadronschools.org/. CPS tech has been working hard to get the new site up and we are very excited about the new look and all of the new features. In addition to the new, attractive look, many changes have been made to the site to make it more user friendly. To start, the new site is mobile friendly! You will see the mobile site layout if you access the site from your cell phone or mobile device. You will also notice new, easy to read, buttons for access to school announcements, the campus portal, menus, and calendars. There is a parent drop down menu where links to the handbook, registration, documents and forms can be found. Parents can also access individual school information by selecting the 'Schools' drop down menu and choosing the school that they would like to browse. Please take a minute to check out the new and improved site. We hope that you find it user friendly and informative.